Yes I was spoiled in the previous article written. But beware the next paragraph! So I've been enjoying Mass Effect 3 to the fullest. I'm not sure why there has been an outrage about the story. While I've seen some weak performances by at least one character I'm not holding that against Bioware. So far this story has been absolutely great. The characters are still very well fleshed out and developed (which makes it harder to take when some meet their ultimate end...). Cerberus has really started to piss me off. Their first couple of attacks are just annoying, like flies, but their most recent attacks on the Asari have just enraged me! Currently putting together missions to kick them in the balls (as James Vega requested). Because of their involvement I lost another homeworld. One that could have been saved! UGH! 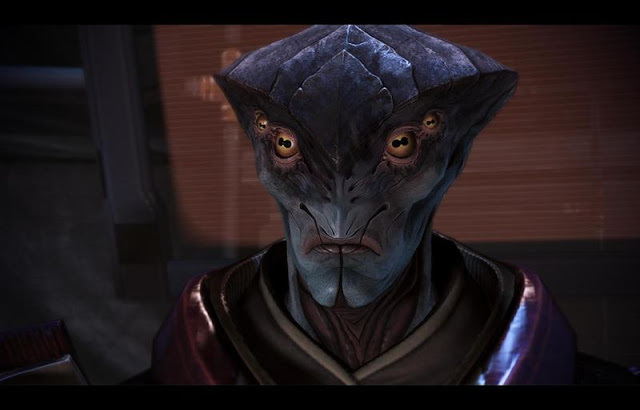 But also damn the Asari for keeping secrets to better their cause. Outside of Mass Effect 3 I'm currently working with a couple friends on a movie/TV series. Interesting stuff indeed. I hope to run some stuff on the site in the future. Getting busy busy busy again. For what I'm aiming to play/do in the next week? Hmm, finish up Mass Effect 3, further my cause in Crimson Gem Saga and wade through some older games while trying to live through the usual video game release drought. Of course I do have The Last Story coming for the Wii so that will help, but it's a still a few months out though. So after Mass Effect 3 gets completed I will likely start working on the movie/TV show in until I'm ready for the holiday season to start.